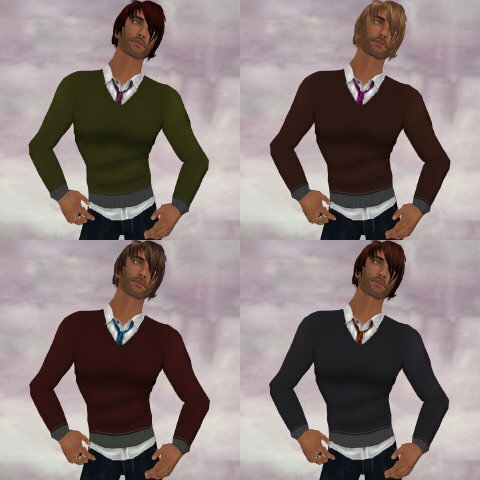 • Introducing today a new outfit from “Fuse” by Jonathan Hugo: “Oxford”, a V-neck sweater on a shirt with loosen tie, plus dark jeans. Jonathan Hugo, the maker, does high quality stuff at reasonable prices. Oxford is really nicely done, with textures showing the different fabric “touch”: you can “feel” the wool of the sweater and get the shine of the silk on the tie! Tops come as combos on the jacket layer, in 4 colors (shown) and you can choose two shades for the jeans classic denim (shown) and black. Jeans come with sculpted cuffs. Well, it’s no secret that I’m not fond of them. I find them impossible to adjust perfectly most of the time. I have to admit that, with these ones, adjustment is pretty easy, plus their color and pattern fit perfectly the pants layer. Everything is moddable and copy-no transfer. I love “Oxford’s semi casual look, dressy and laid back in the same time. I just wish more layers options to wear it under a coat or a jacket! You can get separately the tops for 115 Lindens per color, or pick them all for 350 Lindens, jeans for 110 Lindens per color. 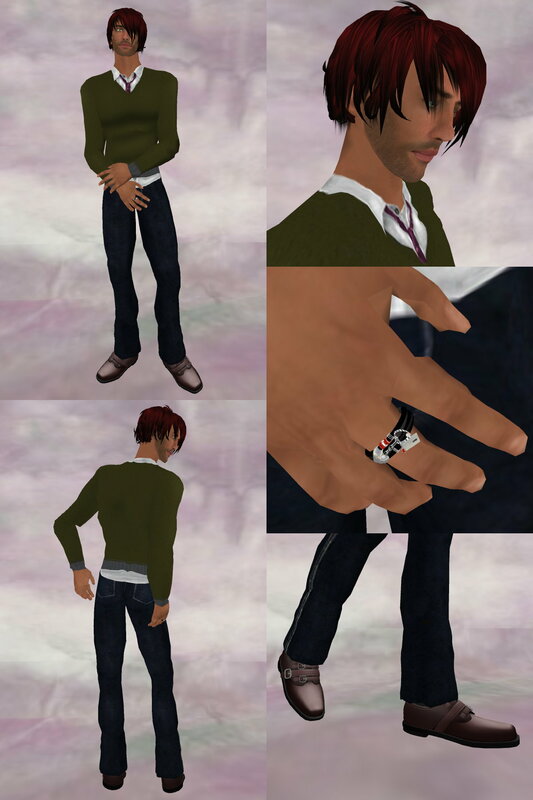 • Also showing another new hair from Truth Hawks for “Truth”: Jared. Truth offers now a full range of hair for men, fitting various needs, from tamed to messy. Jared offers a rebel look and can add some spice to any outfit, including the most classic ones. But there is more! Truth redid all his hair textures, enriched them and offers now 72 versions for each cut, including new colors and a lot of tipped options. Prices stay very attractive, you can now get a pack of three close colors for 200 Lindens, and enjoy the full 72 version for an incredible 1500 Lindens! The new colors are really cool, and you can pick interesting alternatives like the “dark “options (2 are shown below). Note that to celebrate it’s first year, “Truth” offers to group members (subscribomatic system) free hair in the new 72 colors until Sunday. Go there quickly! Fuse Oxford Top in “Botanica” and Truth Jared in Blood-Dark, Fuse Oxford Top in “Chocolate” and Truth Jared in Honey, Fuse Oxford Top in “Burgundy” and Truth Jared in Panama, Fuse Oxford Top in “Navy” and Truth Jared in Auburn Dark. • Shiny Things offers a group sale this weekend only! All sculpty shoes are 50% off for group members only (use the search in “group” section.) This includes the Spencers shown today. Hey, 50% off, who can resist? For now, the slippers come only in “bean” (some brown plaid), shown, and in “splat” (white with some red product splattered on them, strawberry jam or blood, depending on what scene you are playing in). More colors will be soon offered! They come in two widths in the same pack, for two different looks, and their size is finely modifiable by menu. You can precisely adjust their size to make them harmonious with your avie size (this is not done to fit your feet, which have to be set to zero in appearance mode in any case!). As each shoe must be adjusted independently, be careful of what modification you apply on the first shoe, to do the same to the other one! Don’t worry, if you got lost, you would just have to reset the size and modify it again. These slippers are, as always at Akeyo, nicely built and textured. You can have them for 350 Lindens per color. Rei Gulli has created a few original men’s hair for “0 Style.” Reo is one of his last production. I like the “gently messy” look it gives. This hair is very flexi, which adds some realism outdoors. It comes in 6 packs of 3 close colors each (darks, brunettes, blonds, reds, whites and gray - more ashed blonds for this last one). Each triple pack is sold for 300 Lindens. To go along with these new items, I chose good jeans from “Fuse,” an original tank top from “Dutch Touch” and some “rough” jewelry from BroGear and Philotic Energy.